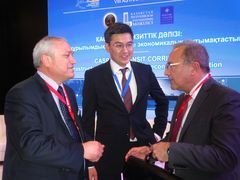 During Astana Economic Forum, Mr. Ciopraga, TRACECA Secretary General met with Mr. Vahid Aliyev, Deputy Director General of the Baku Sea Port. Baku Port has plays an important role in Caspian trade for over one hundred years and is the main marine gateway to Azerbaijan. The port operates non-stop and is an important transit point in Europe-Asia trade promoted within TRACECA. Parties exchanged views on the possibilities of the port, the exploration and development equipment to be delivered through the Baku port as well as on the status of the construction of new Baku Port in Alyat. Mr. Aliyev briefed Mr. Ciopraga that the port consists of the Main Cargo Terminal, Dubendy Oil Terminal, Ferry Terminal, and Passenger Terminal. Its throughput capacity has been constantly growing and is now 15 million tons of liquid bulk and 10 million tons of dry cargoes. Mr. Aliyev and Mr. Ciopraga agreed to continue discussion during next meeting in TRACECA Headquarter in Baku, Azerbaijan.